For those who want to see enchanted aquariums, blue waterfalls in the middle of the forest and immaculate springs where you could dive and float together with a multitude of colorful fish, this tour is what you need. 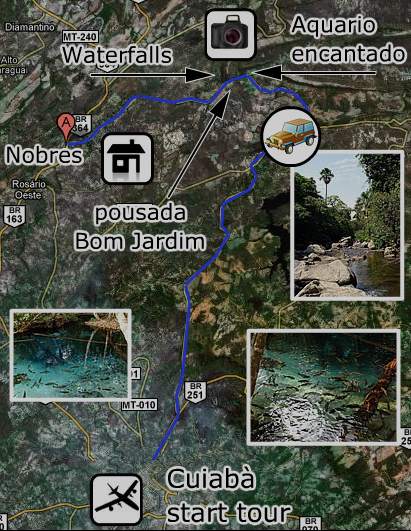 Stages: Cuiabà Airport; Vila Bom Jardim; Lagoa das Araras; waterfall “da Serra Azul”; Rio Triste; Enchanted Aquarium. Conditions: The cost of the Tour in Nobres includes transfer to/from Cuiabà airport or town, all transfers mentioned, stay in pousada/hotel by half board, daily excursions with a bilingual guide. Departure from Cuiabà Airport to reach the village of Vila Bom Jardim, which is about 130 km away. After the placement of your luggage in the Pousada Bom Jardim, we will visit the “Enchanted Aquarium” where, once equipped with the necessary equipment, we will make a journey of about 800m, drifting in the midst of innumerable fish with different shapes and colors. In the afternoon there is a visit of the “Lagoa das Araras”, where we will meet hundreds of blue-and-yellow macaws (with yellow and blue plumage) in a very special environment. Departure in the morning to reach the “Serra Azul” waterfall (45m). Considered one of the most beautiful waterfall in the world, it is plunged into the jungle in a suggestive and romantic setting. Then return to Cuiabà Airport.